Selling your house? Then you need great real estate photography! Take your own MLS photos with these 10 tips for photographing the interior of your home. 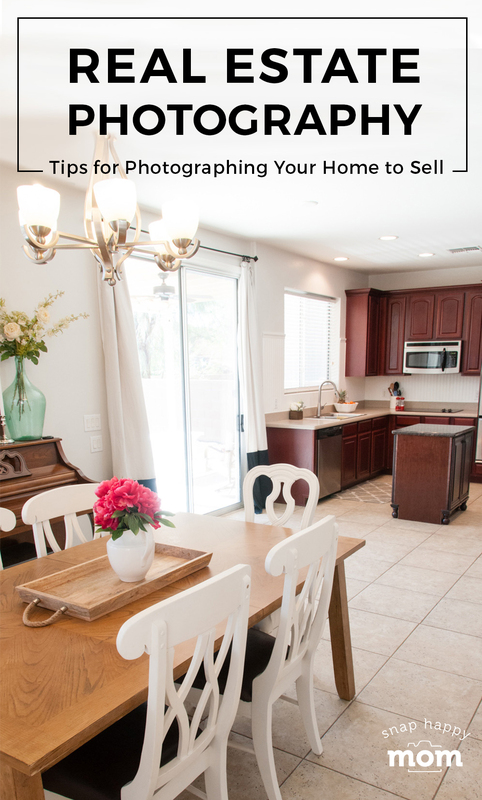 If you are trying to sell your home, you absolutely must have good photos for your listing! The photos are the first thing prospective buyers see, and you want to make a great first impression. 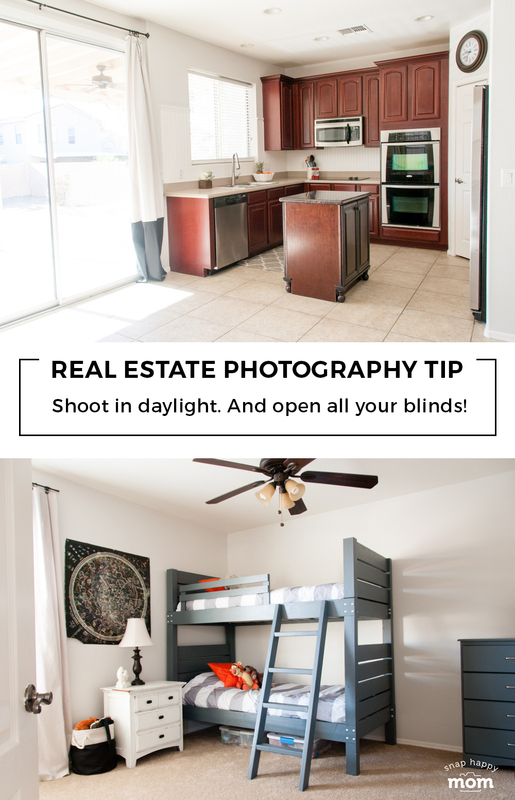 Depending on your realtor, you may need to provide your own pictures of the home, so use these tips to take good real estate photos yourself! 1. No cell phone shots. You need a DSLR for real estate photography! I know a phone is handy, but it is just not going to show off your home. 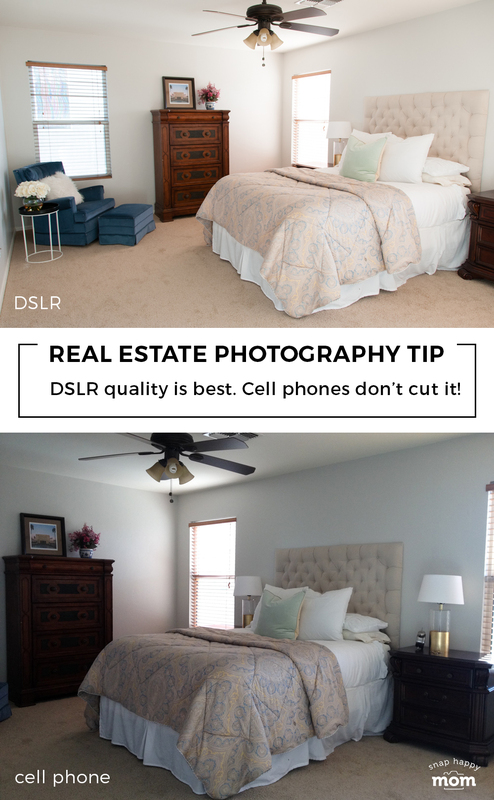 A cell phone or point & shoot camera simply cannot give you the quality, format, and detail you need for pictures of a home you’re trying sell! The picture format 0n a DSLR is wider, allowing for more of your room to be shown in every photo. DSLR cameras shoot at a 4:3 ratio, while cells phones only shoot at 3:2. That means a DSLR will take a wider photo horizontally from left to right, which will show more of your house. You can shoot on a wide-angle lens on a DSLR, while you’re limited to a normal cell phone lens otherwise (more on this below). The picture quality is several times better, which means you can have more detail in the shot when viewed full-screen. A DSLR photo can take advantage of more powerful editing capabilities with computer software – cell phone apps have basic editing options only, with much less control. Here’s an example of what DSLR quality on the top, and cell phone quality on the bottom. If you want your house to sell quickly, you should be willing to take the best possible photos you can get! If you don’t already have a DSLR, then these are the cameras I recommend. You could choose any of these cameras and use the kit lens to take pictures of your home. You could also ask a friend with a camera to come and take photos – but having a high-quality camera to use with your family is worth it! 2. Use a wide angle lens, but don’t misrepresent the home. DSLRs have different lenses that help capture the photography. You’ll want to use a wide-angle lens to get the best interior shots of a house – so you’ll need something that goes down to 10-24mm. The kit lens that came with your camera should a be sufficient for this, in the “zoomed out” 18mm position. The wide angle will help you capture the whole room at once, as opposed to only being able to capture one wall or corner of the room. The point is not to distort the room, but to help the viewer visualize what the whole room looks like. 3. Choose flattering angles that show how the rooms connect. Choosing the right angle is half the battle for home realty photos! You want to take pictures that show the architecture of the room nicely – since usually the furniture and decor isn’t part of the sale. Taking a picture of the room from the open doorway is usually a good start. Play with the composition to find an angle that shows how the room connects to other parts of the house, but don’t over exaggerate the true scope of the room. Notice how this sequence of images helps you understand the open floor concept of the main floor. 4. Show off your house, not your stuff. Remember that you’re not trying to show off your possessions or furniture – you’re trying to sell the bare bones of the house. So when in doubt, chose angles that showcase the architectural details of your home, not your furniture. You also don’t want your stuff to distract from your home. Too much clutter makes any room feel smaller! Stage your home to make it feel more approachable in photos. For 8 tips on staging your home for photographs, click here! 5. Plan to shoot your home in broad daylight. Nothing will help more in pictures of a home than using natural daylight. Make an effort to schedule your pictures for a bright, clear day! Indirect sunlight is best – big patches of direct sunlight will be washed out in your photos. You may have to shoot different rooms at different times of the day, depending on how the light comes in through the windows. 6. No people in the pictures – including mirror selfies. The point of home realty pictures is to help the viewer picture themselves in your home. Under no circumstances should you have people in the shot – no matter how cute they are! Take care to make sure no little feet are visible in your photos, or any other people. This is especially important in rooms that feature large mirrors or reflective glass! You’ll have to plan on shooting from an angle to avoid having the photographer and camera showing in the reflection. It’s tacky at best, and definitely not the kind of picture you want on an MLS listing. 7. Take horizontal shots where possible. Take wide, landscape shots whenever possible. This helps people visualize the room, instead of just seeing one wall at a time. It also keeps too much floor/ceiling from being in the picture, which is usually not super interesting or flattering in pictures. Vertical orientation should be used in two instances. First, use a vertical photo if there is a wall in the way of your horizontal shot (such as in a small bathroom or laundry room, and you simply can’t move further away.) Second, vertical photos often help when shooting a stairway or great room with extra tall ceilings. 8. Get the right settings for sharp photos. 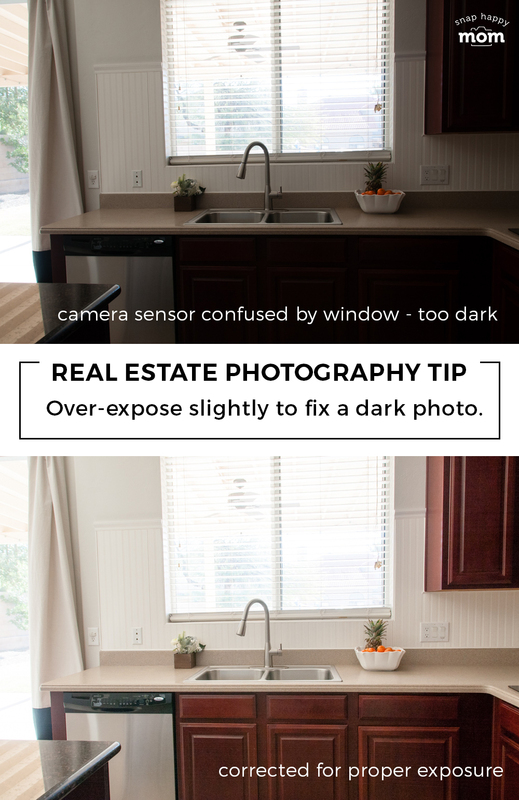 There are two parts to getting sharp photos of a home. First, you want as much in focus as possible – things that are not in focus look blurry and not sharp. The f-stop indicates how much will be in focus in the picture, or how much “depth” you have around your focal point. Second, you may need to use a tripod to hold your camera steady for a longer shutter speed. This is especially true if you are using a small aperture for a large depth of field: you will need a longer exposure to get enough light in the shot. Most people can’t hand-hold a shot slower than 1/60 of a second. If you need that slow of shutter speed, I recommend setting up a tripod and using a longer exposure to get the appropriate amount of light. 9. Fix a dark photo by over-exposing it slightly. Most cameras tend to under expose interior shots because the sunlight coming through the windows tricks the camera sensor. The light meter doesn’t know that light isn’t part of the room, so it makes the whole picture darker to compensate. If you’re comfortable using exposure compensation or manual mode, this is a good time to over expose past the point the light meter says is balanced. Don’t overdo it, but slight adjustments for exposure are fine. 10. Edit your photos carefully to get a true representation of your home. Your picture will benefit from some color correction, lens correction, and exposure tweaks. However, the point is to enhance what’s already there, not misrepresent it. For exposure, you may want to brighten up the images slightly – but don’t brighten them so much that it becomes an inaccurate representation of your house. Usually, I use the auto tone function in Lightroom first and then manually up the exposure by 1/3-2/3 of a stop. For color correction, use the white balance settings. Just make sure everything looks natural: use the white balance settings for tungsten and fluorescent lighting appropriately to remove unsightly tones. For lens correction, you want to “enable lens correction” in Adobe Camera Raw window of Photoshop or in Lightroom. This will help account for the wide angle lens being used, and keep straight lines looking straight in your photos. I don’t recommend any other editing since you are trying to produce a true record of what the house looks like.